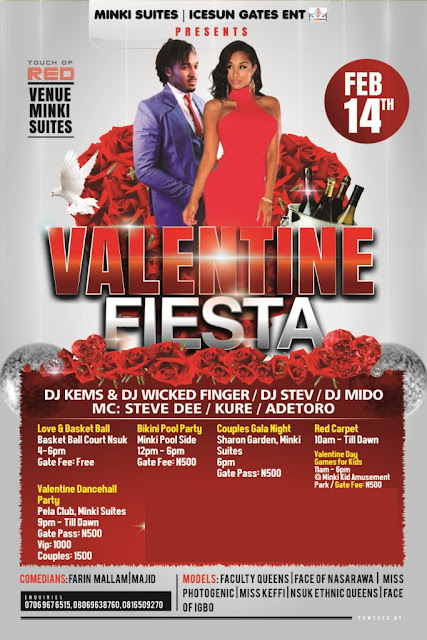 The season of love is here again, Icesun Gates Ent and Minki Suites have come together to bring you a special Valentine’s event – VALENTINE FIESTA!! Party in style with Keffi's finest, Beautiful Models from in and out of keffi, the best Djs and Mcs and the hottest musical acts and performers in town! This show is the biggest valentine fiesta keffi has seen till date and trust me you do not want to miss it. Lots of events and activities are packed in this fiesta! It promises to be a fabulous and thoroughly enjoyable fiesta! All roads lead to Minki Suites on valentine’s day. Don’t miss out. Na wa o, persin no go fit go church on sunday?? will the models wear bikini? 2 ladies as coples is it possible?